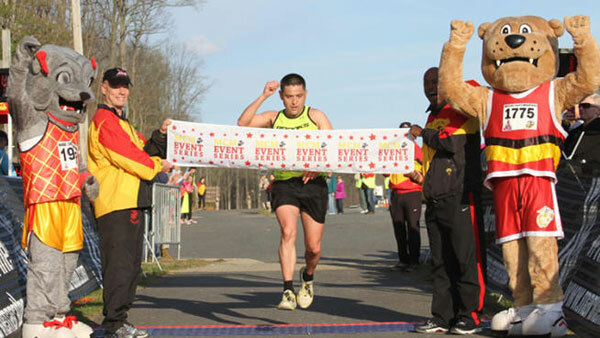 QUANTICO, Va. – It was a stimulating run through the twists and turns of Prince William Forest Park for the 1,749 finishers in the Marine Corps 17.75K held in Prince William County, Va. on Saturday, April 12. 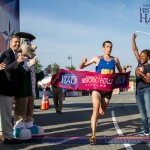 Former U.S. Army runner Steven Henry of Odenton, MD met the challenge while winning the Marine Corps-themed, 11.03-mile event in 1 hour, 4 minutes, 25 seconds. “I guess I am in a lot better shape than I thought I was,” Henry joked as he completed the 17.75K, named for the founding of the United States Marine Corps. 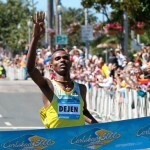 “It was challenging and very tough but I really enjoy it,” he added. 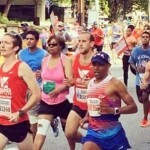 Henry, 38, is a retired Infantry Soldier and five-time Marine Corps Marathon (MCM) finisher who previously completed the Marathon while a member of the U.S. Army’s elite running team. Finishing just over a minute behind was Jeremy Lynch, 33 of Springfield, VA, who placed second (1:05:08). “This is one event that captures the essence of the Marine Corps because it’s one where you have to take hill after hill and meet the challenge just like a Marine,” said Lynch. “This was phenomenal,” agreed MCM Hall of Fame member and retired Marine Lt. Col. Alex Hetherington of Vienna, VA after completing the event in 1:05:46 and taking third place. Women runners were eager to charge the hills too, as Kelly Swain, 28, of Arlington, VA finished first among the ladies in 1:14:02. “I thought the course was tough and at one point around mile five I thought I was tanking but then I really picked up my pace,” she said. “I really want to run the Marine Corps Marathon.” After finishing the event, Marine Corps 17.75K participants received a “guaranteed access” pass enabling them to register for the sold-out 39th MCM on Oct. 26. Holly Fleming, 25, traveled from Bloomsbury, NJ to run today’s event and capture her place in the 39th MCM. “I got my dad to run and he’s going to run the Marine Corps Marathon with me too,” she said. 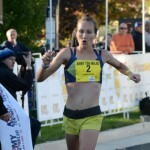 Fleming finished the 17.75K in 1:17:28 with her father, William, expressing his pride as Holly received her award for second place. “Although I have done three Marine Corps Marathons myself, Holly is a much better runner and much faster than me,” he boasted. Displaying pride for the brotherhood, Marine Lt. Col. Kristin McCann took third place (1:21:25). “I think we [the Marines] beat the hills today but they put up a good fight,” admitted McCann, a member of the U.S. Marine Corps elite running team. McCann has run with the Marine team in every MCM since 2001. Marine Corps 17.75K participants who received guaranteed access at the event must register for the 39th MCM by midnight April 14 atwww.marinemarathon.com. The Marine Corps 17.75K is the first in the MCM Event Series organized annually by the Marine Corps Marathon. The MCM Event Series includes Run Amuck and Mini Run Amuck in June, the Quantico Tri in August and Turkey Trot events in November.